Located within Thacher State Park, the campground offers 140 peaceful, wooded sites, recreational facilities, a sandy beach, carry-in boat access, fishing areas, and nature trails. NYS Parks, Recreation, and Historic Preservation operates the campground, which is open May-October. Details here. Thompson's (or Thompsons) Lake straddles the border between Berne and Knox. In the late 19th and early 20th centuries, it was a popular summer resort and boasted several hotels. Vacationers enjoyed the fresh mountain breezes and homegrown food. More history at Albany Hilltowns. 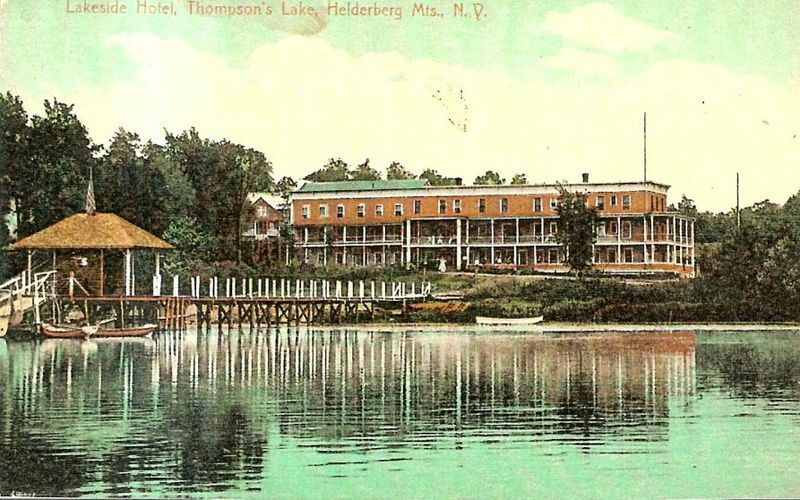 Lakeside Hotel, Thompson's Lake, Berne, NY. No longer standing. Postcard photo from Albany Hilltowns.